Feijoa paste is delicious and pretty easy to make, but it doesn't look that great. With lots more feijoas to use up, some rotting in places, I decided to try making feijoa jelly instead. Feijoa jelly with muesli and yoghurt. Rather than scooping out the insides of the feijoas, I chopped them up, making use of more of the fruit, including the skins. This made it easier to remove the damaged parts. Basically following Allyson Gofton's recipe, I put the feijoa pieces in a saucepan, covered the fruit with water, and brought it to a boil. I simmered it for 50 minutes before pouring the liquid out. You're supposed to strain it through a "jelly bag", but I didn't know what one was, so I just put several layers of muslin over a sieve. I also put a cake rack (balanced on a couple of drinking glasses) over the top to keep the larger pieces of fruit out. Other people have reported using a pillowcase with success. Although I tried not to press on the pulp, the liquid that I collected was very cloudy, with a muddy colour that did not look appetising at all. I wondered if I needed to try harder to find a jelly bag after all. As I don't like to waste things, I decided to carry on and attempt to make a jelly anyway. I boiled the 500mL feijoa liquid with slightly less than two cups of sugar, and after clearing away some surface scum, I was amazed to see it turn clear and orange in colour. Liquid became orange and clear on heating. Cooking it for a bit longer made it almost red. A similar colour change happens when you make quince paste too, and apparently that is because cooking destroys the tannins in the fruit, releasing the coloured anthocyanin pigments. The liquid set surprisingly firmly on cooling, so the jelly did not spread easily like jam. Because I included the skins, it had a slight bitterness to its floral flavour, as in marmalade. It took a bit more effort to make this, because of the draining step which wasn't needed for feijoa paste, but the end result was gorgeously smooth and clear. Sweet, delicious success! 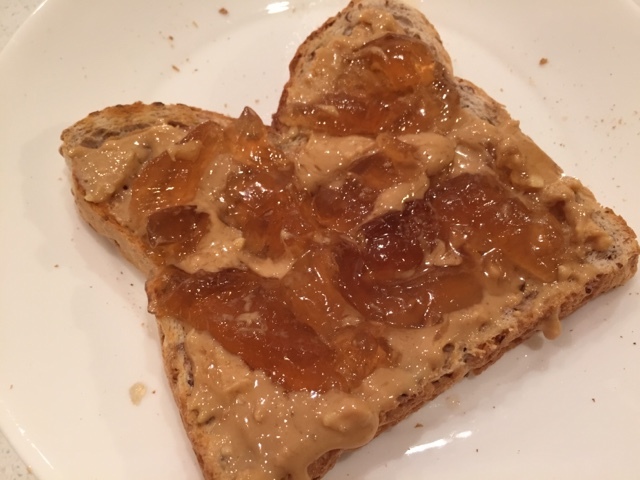 Homemade peanut butter and feijoa jelly on toast. This post is part of Our Growing Edge, a monthly blogging event aimed at inspiring us to try new things. This month, it is hosted by Maddie from Supper Lovin’. I never thought about making apple jelly (I guess I never have an oversupply of apples), but sounds like it would be delicious too. Looking forward to hearing about your efforts! Not sure where in Australia Fiona lives. Here in Adelaide, South Australia, Feijoas absolutely thrive! At the moment I have more feijoas than I can cope with, and am giving many away, as well as making a lot of chutney. Now I'm going to try the jelly recipes I'm finding, as they look really great! Great! Keen to hear if you notice much difference between the different recipes! I've only had time to try one recipe, the simple one with just 3/4 cup sugar for every cup of liquid. It looks good, and has jelled perfectly.